For dinner this week, I made a big bowl of my family’s favorite salad. It is basically grilled chicken, bow tie pasta, croutons, mozzarella cheese, and sliced cucumbers. It’s very basic, but it is not only great, but it is one that both of my non-salad eating boys devour. With that said, I had a bit of an English cucumber leftover that I was not going to let go to waste. At first I thought I would just slice it and put it in a salad for the next day’s lunch, but then it occurred to me to make a quick pickle, but Korean style. In the last couple of years, I have been a huge fan of a Korean fermented red chili paste known as gochujang. You can find gochujang in any Asian market, or online for that matter. It has this savoriness and spiciness that is so well balanced that it almost becomes addicting. I’ve been using it in stews and braises, and I can tell you it is now one of my top five ingredients. This is when I thought of making a Korean style quick pickle to be eaten for dinner the following day. 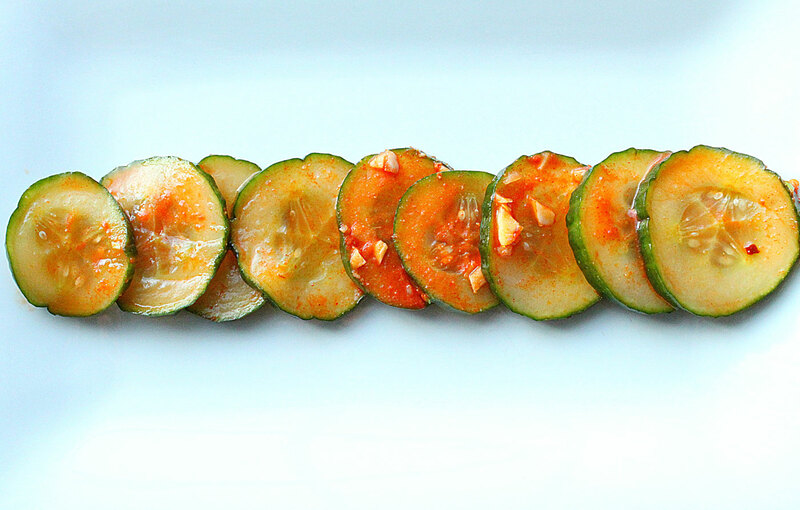 These pickles are so good, you will probably become addicted to them. Unlike a dill, or ‘butter’ style sweetened American pickle, these are balanced with sweet heat that just go so well with pretty much anything. Add everything but the sliced cucumber to a small mixing bowl, and stir to incorporate. Add in the sliced cucumber, and gently mix to distribute all of the ingredients into the cucumber. The cucumbers will soften slightly the following day. When you are ready to serve, place them as a side dish on the table. 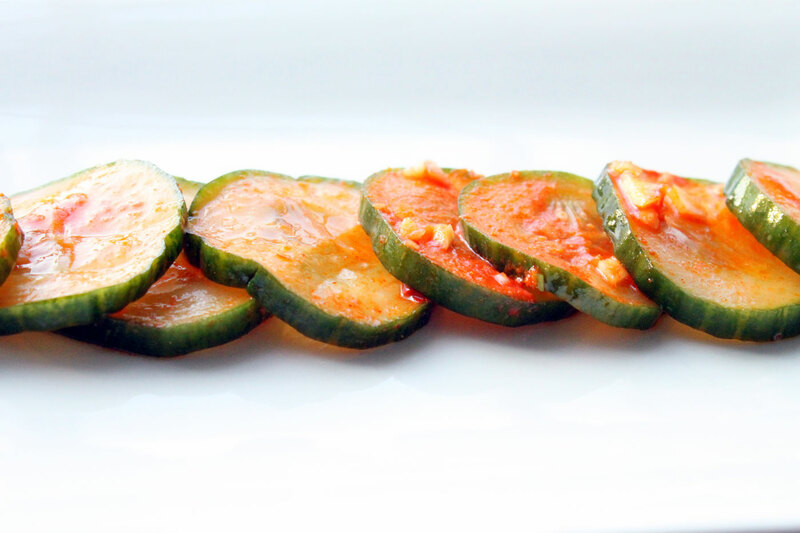 These Korean style quick pickles are so well balanced, and again, addicting. They pack this sweet heat, along with just that perfect bite of garlic that they have you going back for more. So go find yourself a tub of that gochujang and start exploring the many dishes you can add it to. Did I mention how good this stuff is in soup? Yum! These look so good. 🙂 I am making these tonight for bibimbap! I can already taste the delicious pickly crunch in my mouth. Have you ever tried using the Korean dried chili flakes (gochugaru) by any chance? 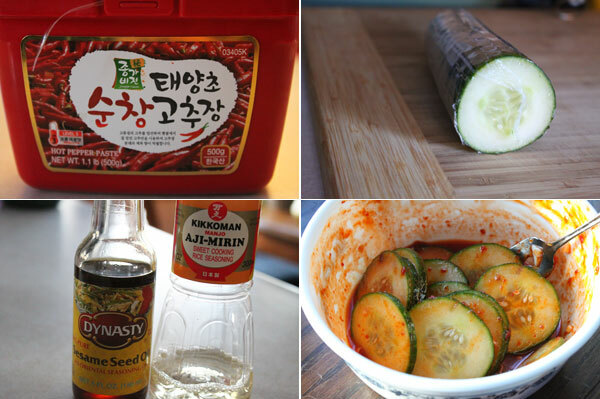 That’s what I usually use instead of gochujang – it has a more neutral amount of heat and less sweetness! Either way, these are a winner though! Hi Esther! Thanks for the comment. I do use gochugaru on occasion, and love it as well. You can actually add a teaspoon into the mix here if you want. I just left it out as I thought the gochujang would be enough. Hope you enjoy! I stumbled across this recipe this summer, and have been making these pickles every week since. I quadruple the recip and use the brine for a few batches over a week or two. My go to potluck offering is David Lebovitz’s bulgogi chicken with these pickles, and lettuce for wrapping. Last night, the entire party was obsessing over the pickles! Roya, that’s awesome to hear and so glad you all enjoyed!